Tollywood top director Devi Sri Prasad shot fame with his terrific music. His outstanding tunes have the left the music lovers in surprise and he is now one of the busiest music directors down South. 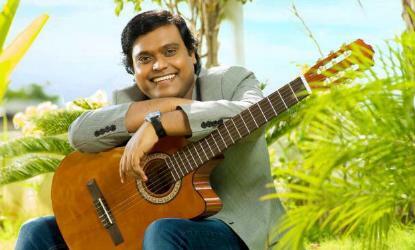 Tollywood has been his main preference and he has been spending time for composing music for Tamil films when he finds time. He has completed 50 movies in his career in no time and Devi Sri Prasad impresses with his electrifying performances during the audio events and public appearances. He has composed music for Suriya’s Singham which was a smashing hit all over. Hari directed the movie and Suriya surprised as a powerful cop in the movie. Anushka played the female lead in the movie and the makers have come up with a sequel which too minted huge money and emerged as a blockbuster. Suriya managed to repeat the complete team of Singham and Devi Sri Prasd composed some stupendous music for both the movies. Now the makers are in plans for the third installment of Singham and the movie has been titled as Singham 3. Hari is busy with the pre-production work of the movie and the regular shoot of the movie is expected to start from the third week of December. Suriya will reprise his role as a powerful cop in the movie. Anushka will play the heroine in the movie and Sruthi Haasan has been finalized to play an important role in the movie. The movie will be shot in Chennai, Hyderabad and Vishakapatnam as per the news. The shocking news is that the makers have finalized Harris Jayraj to compose the music for Singham 3 which left everyone in shock. Sources say that Devi Sri Prasad is charging hefty remuneration which is not making the makers happy and so Harris Jayraj has been brought to the board. When asked Devi Sri Prasad, he denied the news and he revealed that he has his hand full of movies till the end of 2016 and he could not accommodate the dates for the movie. Harris Jayraj who could not score a hit in Telugu has been finalized as the music composer for Superstar Mahesh Babu’s trilingual which will be directed by AR Murugadoss. The movie will start rolling in April next year and will be shot simultaneously in Telugu, Tamil and Hindi languages. Orange movie album is a Blockbuster in Telugu. Get ur facts right admin! !…Remeber the popularity of Manasa song?? Yes he is a hit machine. 2nd only to Ar Rahman.